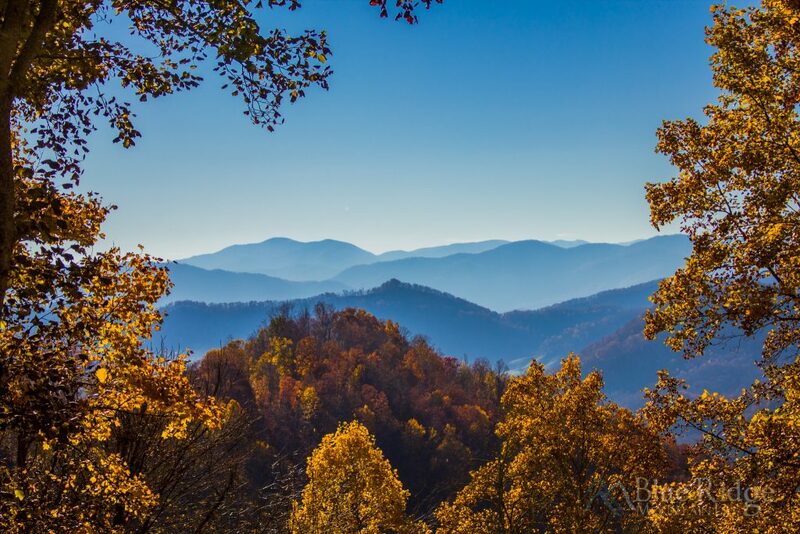 Updated: 10/26/2017 – There are very few things in this world that compare to the beauty of the Blue Ridge and Smoky Mountains during the Fall Season. The mixture of colors that wash over the mountains and surround you are absolutely stunning. The Blue Ridge and Smoky Mountains offer one of the most colorful and longest running fall leaf seasons in the world. So popular, they often get listed on world-wide top places to see Fall color. Being here at peak time is important for seeing the full-splendor of colors, but peak time varies year to year based on the amount of rainfall and temperatures. Peak times also vary by elevation, as color changes begin at higher elevations in early October and progress down the mountains through the end of October and into early November. Provide weekly updates on color, as we get closer to the fall leaf season, and though the fall leaf season. Best places to see the Fall colors, and lots of current and prior year photos. 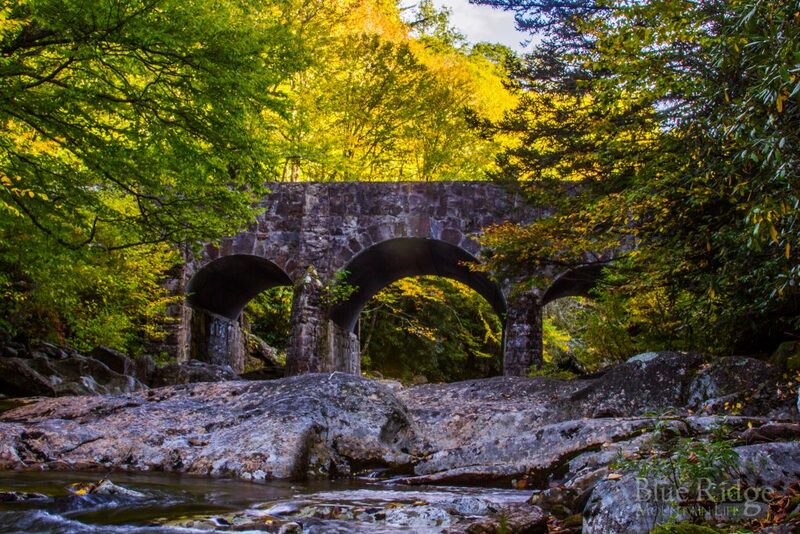 When is the best time to see Fall Colors in Maggie Valley NC? Maggie Valley NC sits at 3,000 feet above sea level. Surrounding mountains range from 3500 – 6,000 feet in elevation. This makes optimal viewing times vary a little depending on what elevation you’ll be at. If you are in Maggie Valley itself, peak time right now should be October 18 – 26. This will also be a great time of year to see colors up on the Parkway as well, as most overlooks look down to lower elevations. Blue Ridge Parkway – October 1 – 26 – Elevation varies greatly on the Parkway, so this makes the date ranges for peak colors vary as well. The good news is that you can visit and drive the Parkway anytime in October and see Fall colors. Waterrock Knob specifically peaks October 1 – 10, but again, elevations viewed are usually lower. Soco Falls – October 20 – 25 – We’ve consistently photographed Soco Falls over the years during this week, and colors have always been at peak. Cataloochee Valley – October 20 – 25 – Color progression in Cataloochee Valley begins in early October, but peak times around the historic structures is a 2-3 weeks later. Purchase Knob – October 10 – 20 – Purchase Knob is higher up in elevation, so peak times will be earlier than Maggie Valley. >> See our Best Places to see Fall Colors in Maggie Valley NC for more options, and great Fall colors! For a full Elevation Guide, see our Blue Ridge Mountain Life Fall Forecast. Falls colors here in Maggie are a bit late, but they’re finally here. Lots of reds, oranges and yellows on the mountains and in town. The whole area is very pretty now, and should be for the next week or so. Right now is a perfect time to visit. Just dress warm, morning lows are in the 30s! Brrrr. We even had snow flurries last night. The photo on the right was taken at Big Creek earlier this week. Join our Maggie Valley NC Life Facebook Group for the latest photos from everyone. Fall color progression has really kicked into gear, in and around Maggie Valley NC. We’re seeing far more color now than green. Peak time should be in the next 1-2 weeks. Hurricane Nate blew through last night, bringing much needed rain, and lots of it. Unfortunately Nate brought lots of wind as well. We’re unsure at this point how this will effect the colors, but we’re hoping not much. Here are a few photos I took yesterday right before the heavy rains and wind moved in. These were taken on Hemphill Road, below Purchase Mountain. Elevation here is about 3,000 feet, give or take. 9/25/2017 – Primary color for Maggie Valley is still GREEN. We’re definitely seeing more splotches of reds and yellows on the mountains and ridges. Higher Elevations outside of Maggie, are seeing early colors and peak times. They are probably 5 days ahead of schedule, but the remaining elevations should stay on schedule due to warm temperatures last week. Right now, Graveyard Fields and surrounding areas are absolutely beautiful, and should peak later this week. Also, Fall Decorations are up in Maggie Valley – Come see all of the pumpkins, scarecrows, corn stalks and more all through the Valley – Special thanks to Sue Pendley of Maggie Mountaineer Crafts for coordinating the decorating. She’s been doing it for over 20 years! 9/5/2017 – The primary color right now is still “GREEN”, but we’re seeing more trees beginning to turn early, just to tease us a little. The real “action” is still 3-4 weeks away. Based on current conditions and weather, we’re on track for a standard Fall schedule (see dates above). The increased rain this year could very well cause some exceptionally beautiful colors this year, including more reds. 8/11/2017 – Still to early for any sign of Fall colors for the most part. Some trees, including sugar maples, are turning early which isn’t uncommon, and varies from area to area, and tree to tree. Based on current rain levels, and temperatures, we’re expecting standard Fall color dates, which begin in early October, and finish up around the first week in November. This of course could change of the next month and half, but not likely. Due to higher rain volume, more vivid colors are expected this year, along with more reds. Stay tuned, we’ll continue to post updates as we get closer to October, along with photos so you can “see” the changes. Book your Lodging reservations early! Hotels, Motels, Cabins, and Campgrounds in Maggie Valley book up quickly. Book dinner reservations in advance if you can. With so many people here in the Valley, it can be hard to get into many of the restaurants. Avoid midday – Midday is the most busy time, and when most people are out. To avoid the crowds, head out in the morning or evening. These times also offer the best lighting conditions for photos as well. Be Patient, and take your time – People from all over the world come to this area to see the beautiful Fall colors. Traffic will be heavy, and there will be lots of people. Be patient. Wear Polarizing sunglasses. Polarizing glasses kill the glare, and allow you to see the colors more vividly. Bring layers of clothing and rain gear – Temperatures in the Fall, especially at higher elevations can very greatly, and often be pretty cold. Bring some extra jackets, sweaters, etc just in case. We would also recommend a raincoat or umbrella as well. Don’t be discouraged if it rains – You might be surprised, but rainy conditions can actually increase the color! You’ll see more color and capture more color in your photos if it’s raining or has recently finished raining. So don’t be discouraged. Fill up that tank! Always leave out on your Fall foliage adventure with a full tank of gas. Gas stations in the area, especially up on the Parkway or in the National Park can be hard to find. Don’t run out of gas. Take a time to spend time the Valley, visiting all the different shops, and enjoying the wonderful Fall decorations in the shops and town itself.